With limited time to explore, how could you possibly get a sampling of the diversity found in a 1.1- million-acre national park? You can drive through Glacier National Park on the Going-to-the-Sun Road, but that just scratches the surface. Three locations on the Going-to-the-Sun Road provide excellent opportunities for you to get out of the car, stretch tired legs, explore, and discover. On the west side of the park dense stands of old growth cedars and hemlocks echo the Pacific Northwest. These ancient trees were once witness to the drumming and dancing from the Salish, Kootenai, and Pend d’Oreille tribes who frequented here and today greet visitors who meander through these giant trees on the accessible Trail of the Cedars boardwalk. Leave your car and enjoy the shade that the towering canopy provides on warm summer days, and its protection during times of wet weather. Stop and listen to the sounds of the forest. The calls of the varied thrush and the red shafted flicker combine with the babble of the rushing waters of Avalanche Creek. Pause at Avalanche Gorge to see the power of water at work, sculpting and polishing the rocks in this narrow chasm. Cap off this adventure with a moderate two-mile hike (one way) to Avalanche Lake. This classic glacially sculpted tarn, with its backdrop of cascading waterfalls tumbling into the lake, is a dazzling site. It's no wonder that it's one of the most popular destinations in the park. 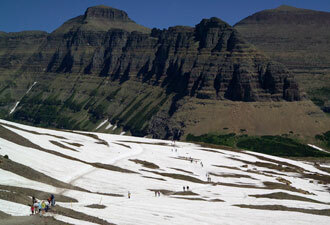 At the summit of the Going-to-the-Sun Road, on the Continental Divide, sits the Logan Pass Visitor Center – your gateway to the subalpine meadows on the way to Hidden Lake Overlook. Surrounded by sweeping views of the mountains, a one and a half mile boardwalk trail lets you safely pass over these sensitive fields of colorful wildflowers. This landscape is very fragile and plants struggle to survive in a short growing season. Please stay on the boardwalk. Don’t be surprised if you see a few of the park’s residents here. 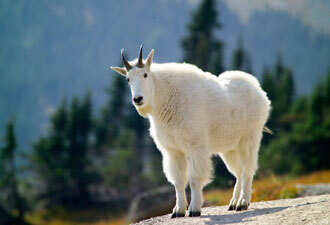 Mountain goats, bighorn sheep, marmots, and grizzly bears can often be seen at Logan Pass, so have your binoculars and a camera with you. Stroll a bit farther to the overlook to see aquamarine Hidden Lake and jagged mountains circling it. Remember those impressive waterfalls at the head of Avalanche Lake? This is where some of them are born. The overlook is the perfect spot for a snack. Columbian ground squirrels will want some food, but resist the temptation to feed them. Habituated squirrels can become pests, and they pack a nasty bite as well. Descending from Logan Pass into the St. Mary Valley exposes you to the sights of massive u-shaped valleys carved out by ice-age glaciers. Following in the footsteps of these ancient glaciers you eventually reach the St. Mary Falls Trailhead, where you can hike to three waterfalls: Baring Falls, St. Mary Falls, and Virginia Falls. Everyone loves waterfalls, right? Well there may be more at work here than meets the eye. These beautiful cascades are spectacular, but fast moving water also generates negative ions. Negatively charged particles help your body produce mood-enhancing chemicals. Linger at the falls on this feel-good hike. 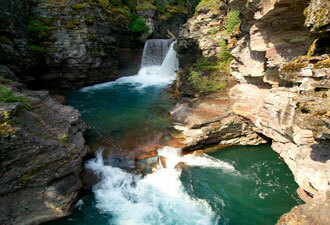 These three locations are just a sample of the wonders awaiting you at Glacier. If you have more time, let our rangers help you explore more of the park, but don't think you can’t have an amazing adventure in a short amount of time. Glacier has something for everyone.